A large portion of holiday shopping made its way online and away from brick and mortar stores for this holiday season and the effect of that change was seen in at least a few ways. Earlier this week it was reported that UPS and Fedex were simply unable to deliver packages on time due to the increase in online orders, and a recent announcement from Amazon may have something to do with that. The online retailer confirmed that it had broken past its previous holiday sales record and in doing so, reached a rate of 426 sales per second during at least one part of the holiday season. This announcement came alongside Amazon’s statement that it had also sold 1 million Amazon Prime memberships before Christmas. Not only did this allow the retailer to meet many of its goals for the season but it also confirmed that Amazon is simply taking over the retail world as more and more people find that shopping online is either cheaper or more convenient than driving to a traditional store. 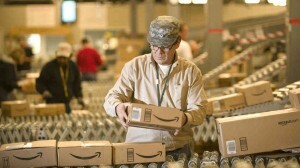 Of course, there are some logistical issues with the increase in online sales (as we saw with UPS and Fedex earlier this week) but as the online sector becomes more profitable, everyone involved will have an incentive to build up their services, making the online shopping process even faster and simpler than it already is and Amazon appears to be spearheading that initiative. The 426 sales per second achievement only stuck around for a short time and was not sustained for multiple days but considering the millions of sales that Amazon sees on any given day, it is possible that 400 sales per second will become quite common in the near future.